Ay, now an old man, apparently became king by marrying Tutankhamun's widow, Ankhesenamun - probably against her wishes since she was actually marrying her grandfather. Evidence for the marriage came from the bezel of a ring seen by Professor Percy Newberry in Cairo in the 1920s which carried the cartouches of Ankhesenamun and Ay side by side: a normal way of indicating a marriage. The wedding must have taken place rapidly because Ay officiated at Tutankhamun's funeral as a king wearing the Blue Crown. Furthermore, by burying his predecessor he also consolidated his claim to the throne. In view of his age, it is small wonder that Ay's reign was brief: a mere four years. There are few monuments that can be identified as his - partly, no doubt, because many of them were usurped by Horemheb. 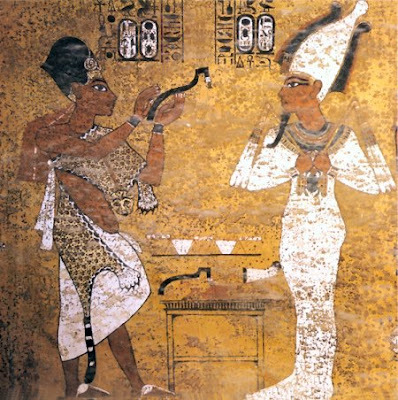 At any rate, work continued on Tomb 23 in the Western Valley (probably originally intended for Tutankhamun), and the walls were extensively painted. It is to be noted that the lady accompanying Ay in the paintings is not Ankhesenamun but his older wife, Tiy. A large stone sarcophagus was provided for Ay which, like Tutankhamun's, had goddesses enfolding the corners with their wings. The tomb was found by Belzoni in 1816, the sarcophagus in fragments. Its complete and domed lid was only rediscovered in the burial chamber debris in 1972. 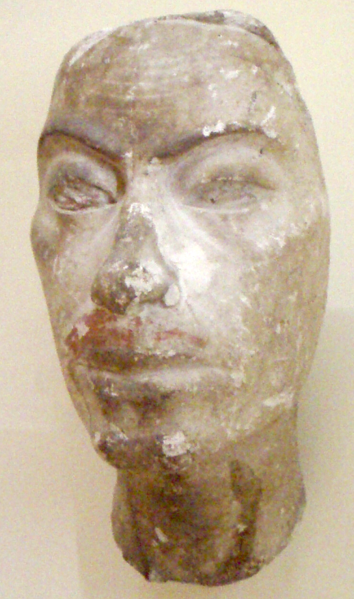 Ay's mummy has not been identified, although Professors Wente and Harris suggested in 1990 that the mummy from the 1881 cache hitherto identified as Amenhotep III might be that of Ay. In fact it is highly unlikely that Ay's mummy survives in view of the destruction wreaked in his tomb. Not only was the sarcophagus smashed, but his figure was hacked out and his name excised in the wall paintings and texts. No ushabti figures are known to exist for him either. This damnatio memoriae seems to have been carried out on the instructions of Ay's successor, Horemheb, which raises the curious question as to why he did not order Tutankhamun's tomb to be similarly attacked and robbed - after all, he could not have forgotten its location in less than a decade, particularly since he was so involved with the burial. In his mortuary temple at Thebes near Medinet Habu, Ay inscribed his name on two quartzite colossi of Tutankhamun, taken from the latter's temple nearby (possibly buried below that of Ay). Even these statues were usurped by Horemheb when he took over Ay's temple. It would appear that Ankhesenamun did not survive Ay and there is no later record of her after the ring bezel mentioned above. With her died the last of the true Amarna royal blood line.